Verrucae are caused by a virus, the human papilloma virus, and cause a skin reaction. They are contagious and are generally are found on the hands and feet where there has been direct skin contact to the virus. The lesions on the skin are called warts on the hands and verrucae on the feet. Verrucae are generally found on the sole (plantar surface) of the feet. On the hands the lesion is proud of the surface but on the feet, because of body weight, the lesion is pressed into the skin as you walk and so will often appear quite flat. The shape and size of verrucae vary depending the stage they are at or the type they are. They might look like very small blisters, have black dots in the centre and can look like a corn to the untrained eye. They are generally unsightly. Verrucae can be tiny at first (1-2 mm) but can cover much larger areas especially if left untreated. Over time several might develop in the same area. They appear separate lesions at first and then with time will join together to form what looks like one large lesion. Verrucae can be extremely painful however in the early stages might not be painful at all. Generally sideways pressure (pinching either side of the lesion) can produce a sharp stabbing pain but no discomfort might be evident from direct pressure. Often verrucae are associated with a large amount of hard skin and it can be this that can cause the discomfort with a verrucae. Removing the hard skin can often significantly ease the pain. Some practitioners and doctors recommend not treating verrucae as they can spontaneously resolve. This is true. 68% of verrucae will resolve within in 2 years. However this means that 32% will not spontaneously resolve within 2 years. In that 2 years you might have infected lots of other people and because they normally multiply with time you will probably have a significantly larger crop of verrucae. Treating a small verruca immediately you notice it is much easier than treating a significantly larger crop of them in 2 years time. Treatment can take many months or longer. 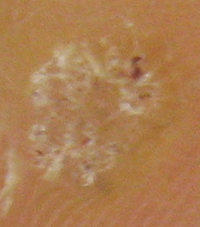 Salicylic acid plasters and paints can be placed directly on top of a verruca to destroy the top layers of the skin which will destroy the verruca. Depending on the strength of salicylic acid you might need to protect the healthy surrounding skin. My recommended treatment for home use is Verrugon (Pickles) which contains 50% salicylic acid. Please carefully protect healthy skin with this treatment. For very young children I recommend Bazuka or Occulsal. Chiropodists will often use higher strength salicylic acid than is available to the general public. Freezing with a very cold spray destroys the tissues and therefore the verruca. Freezing can be painful. Sometimes a small blister will develop, certainly there will be redness and inflammation. Several freezing treatments are needed. Not a one off treatment. Not hugely effective.